It’s a biological fact that as most people age their arms and legs become visibly smaller. This is due to shrinkage of the muscles. Along with smaller muscles comes less strength and the increased risk of falling and fracturing or breaking a bone. Researchers are looking at this phenomenon and its causes and solutions. A group of researchers from The University of Nottingham Schools of Graduate Entry Medicine and Biomedical Sciences believe the cause of muscle wasting could be two-fold. First, research seems to indicate that when older people eat their bodies do not produce muscle as fast as young peoples body’s do. Secondly, the suppression of muscle breakdown, which typically happens with feeding, becomes sluggish in older adults. It appears the biological/hormonal processes that occur in younger people associated with slowing down or stopping muscle breakdown after eating are retarded in older adults.When they eat they don’t build enough muscle with the protein in food; also, the insulin (a hormone released during a meal) fails to shut down the muscle breakdown that rises between meals and overnight. Researchers believe these problems may stem from the fact that nutrients and hormones are not reaching the muscles due to a reduced blood flow. The reduction in blood flow is considered to be a result of inactivity and aging. 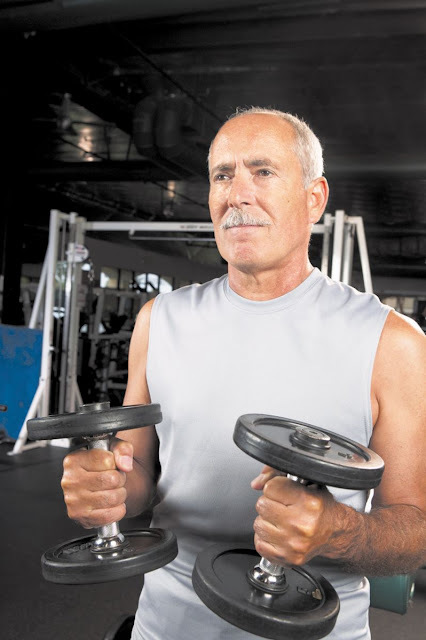 However they believe weight training may “rejuvenate” muscle blood flow and help retain muscle for older people. Professor Michael Rennie, Dr Emilie Wilkes, and their colleagues at The University of Nottingham isolated one amino acid in the legs of both young and old candidates. Test were then done to determine how much protein was actually broken down and used by the muscle before leaving the body. Results indicated the younger people’s muscles were able to use the insulin to halt muscle breakdown while the older people weren’t. Beth Phillips, a PhD student working with Professor Rennie, confirmed his speculation. After predicting weight training would reverse the effects of aging and inactivity on blood flow and thus nutrients supplied to the legs, older people were tested. After three sessions of weight training per week for 20 weeks, Phillips found weight lifting ‘rejuvenated’ the leg blood flow responses of the older people. They became identical to those in the young. Once again we are remind that there are many benefits associated with a health lifestyle. It is never too late to begin implementing activities that lead to living a healthy lifestyle.